Scott Nicholls riding for Peterborough Panthers against Ipswich. I like promoter Ged Rathbone’s refreshing honesty towards Panthers’ fans so I salute him and his team for securing a second major speedway trophy of the season last week. Rathbone has endured another troubled summer off the track so hopefully stunning successes will persuade him to keep the club going. I love to see all Peterborough sports teams do well (apart from one football club), but speedway continues to be ruined by farcical rules. Panthers borrowed Scott Nicholls for the first leg of their KO Cup final against Ipswich. 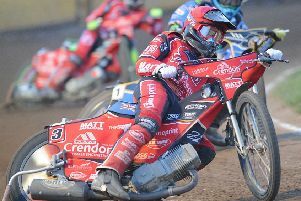 He then rode for Ipswich in the second leg against Panthers thus possibly becoming the first rider to receive a winner’s and a loser’s medal from the same final! Troy Deeney’s fan club were quick to applaud an average, limited bruiser of a footballer when he bragged about roughing up the vastly superior Arsenal players recently. They were a little slower to speak when this slow, clumsy plodder showed his true colours by a cowardly grabbing and gouging of a much smaller player’s face in the heat of battle last week. The Premier League would be a better place without ‘characters’ like Deeney. An Australian referee took charge of Australia v England in the opening match in the Rugby League World Cup. How silly, not least for the referee himself who was placed in an impossible position.